Everywhere I turn recently I hear more about the abject story of the serial-harasser and generally thuggish Richie Incognito of the Miami Dolphins. As you most likely have heard he so hassled and threatened his teammate, Jonathan Martin, that Martin left his team and multimillion dollar salary. Apparently Incognitos activity was tolerated and quite possibly encouraged by the coaching staff. 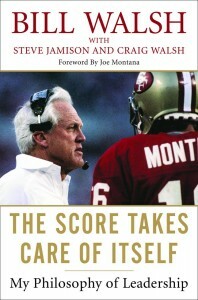 I am reminded of an inspirational book I recently read by football coaching icon Bill Walsh of the San Francisco 49ers. I had intended to write a post eventually about Walsh’s emphasis on meticulous preparation when I write about preparing for an advertising sales call. But I determined this needs attention now. The late Bill Walsh was the coach that turned around the lowly 49ers in the 1980s from a two-win team to a five-time Super Bowl Champion. No sport is more competitive than the NFL. Yet Walsh won with more consistency and more class than any other coach for a decade before he retired at the top of his game. There is no doubt that Walsh selected and coached his players to be tough. But it’s also worth noting that he felt there was no place on the team for harassment of teammates. In fact, he specifically banned hazing of rookies and walk-ons, including the innocuous requirement that they carry the bags of the veterans. Walsh’s mantra to veterans was that it was their responsibility to help teach the rookies and walk on to be successful. Walsh was famous for meticulous preparation for every aspect of the game, including the unlikely and the unexpected. Preparing for an advertising sales call is similar in that sales managers go into an unpredictable situation daily. They must have a plan, and they must know how to adapt that plan based on the responses of their prospects. Miami Dophins management ought to re-read the book The Score Takes Care of Itself; My Philosophy of Leadership. I say re-read it because it’s hardly believable to me they would have skipped reading such a book by such an icon of coaching within their own sport. Clearly, there is no need for hazing and anti-social behavior to “toughen up” players or create team chemistry and camaraderie on a winning football team. Proper preparation will do it’s job. 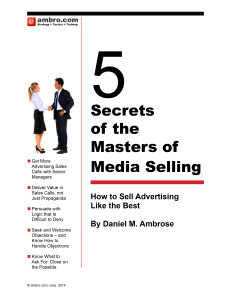 Advertising Sales Directors, and Publishers, too, should read the Walsh book. Walsh’s philosophy of detail-oriented preparation and teamwork is not only inspiring, it also provides a valuable learning opportunity for any sales organization. Your veteran sales people can help you train your younger sales people with support for their sales call preparation, and support for problem solving when the calls don’t go as well as planned.